Welcome to another brand new post on IBeautySpy! 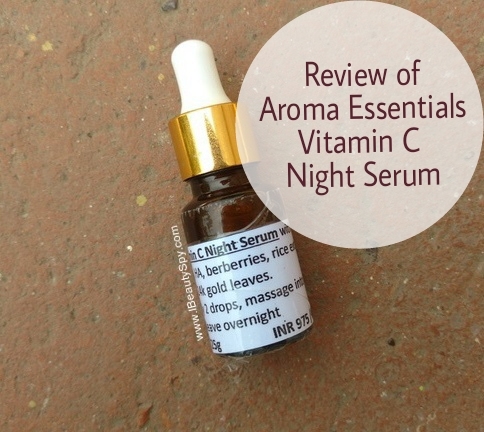 Today I will be reviewing Aroma Essentials Vitamin C Night Serum which I have been using along with their day serum. Aroma Essentials offers two variants of vitamin C serum – one for day (which is light and refreshing) and one for night (which is more nourishing). I have already reviewed Aroma Essentials Vitamin C Day Serum here. Do check out in the above link. So how is their night serum different from the day serum? Let’s see here. Sleep your way to gorgeously glowing skin! Sounds like a dream? Well, it just came true in the form of a magical elixir that we at Aroma Essentials are proud to present – our Vitamin C enriched Night Serum. Loaded with ingredients that your skin will erupt in a happy dance into upon knowing, our little wonders USP is the presence of 24k gold leaves. Renowned for its ability to lighten skin, age spots, uneven complexion, blemishes, freckles, pimple spots and an array of such imperfections, it also contains berberries and rice extract. Both of them are hailed for their ability to tone and brighten skin. From tiredness to dullness to attack by countless skin foes throughout the course of the day such as – dirt, dust, pollution, contaminants, sun exposure, etc, bask in the glory of our miraculous potion each night. Your skin deserves its daily dose of love and care. And what better if your inherent royal is roused as your skin goes into repair mode? Sit back or dose off with a few drops of Aroma Essentials Vitamin C Night Serum massaged gently on your cleansed skin. Wake up to a recharged you! Rs.975 for 12g and Rs.1450 for 25g. Aroma Essentials Vitamin C Night Serum comes in a dark tinted glass bottle with dropper packaging similar to the day serum. Aroma Essentials Vitamin C Night Serum is colorless with tiny gold particles in it. 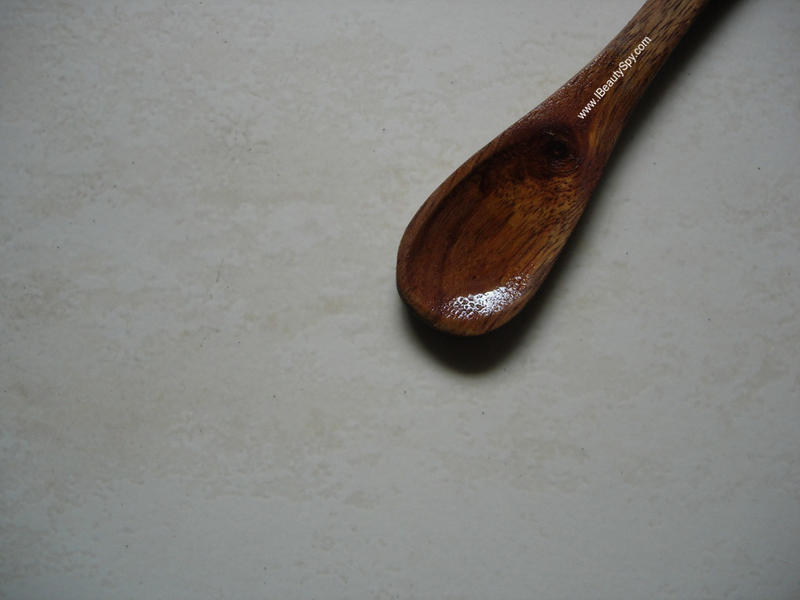 The consistency is runny and slightly thicker than the day serum but still very light. This has a different fragrance than the day serum (which was citrusy). This doesn’t smell citrusy, more like fruity and sweet. You just need 2-3 drops of the serum to cover your face and neck. Aroma Essentials Vitamin C Night Serum is very light and gets absorbed quickly. It doesn’t contain any oils, so it wouldn’t clog pores. It is necessary to follow up with a good moisturizer or facial oil after applying this. This contains a higher concentration of vitamin C (20%) than the day serum (12%) and so it is more powerful. 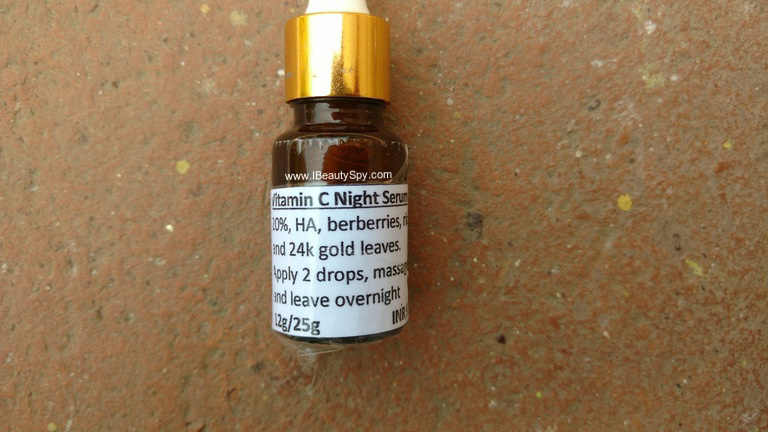 With continuous use of Aroma Essentials Vitamin C Night Serum, it has made my skin soft and smooth. The vitamin C provides mild exfoliation and speeds up turnover of cells to reveal new skin. The serum has improved elasticity of skin and worked on some fine lines in my forehead. Also I could see a visible brightness and nice glow in my skin. It works on fading dark spots and acne scars as well. The ingredients list is definitely awesome. Not only does it contain vitamin C and Hyaluronic acid which are meant for skin lightening and hydrating, but it also contains rice extract, berberries and 24k gold leaves. Rice helps in brightening and clarifying skin. Berberries contains arbutin which naturally lightens and brightens skin and reduces pigmentation. Gold flakes penetrate deep into the skin to improve blood circulation, fight free radicals and restore the skin to a revitalized, glowing and youthful appearance. It also improves the appearance of fine lines and wrinkles. I haven’t come across any other vitamin C serum in the market which contains 24k gold flakes along with it. Thanks to Aroma Essentials for this innovative product. * 100% natural and free from harsh chemicals. * Excellent, unique combination of ingredients for brightening as well as hydrating. * High concentration of vitamin C – 20%. * Light and easily absorbed. * Brightens and gives glowing skin. * Helps in fading dark spots and acne scars. Slightly pricey. 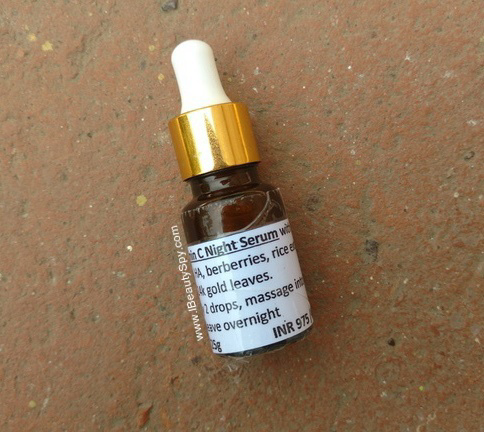 But if you consider serums from brands like Just Herbs, Gulnare, etc, they are priced similar. This has 24k gold flakes as well due to which the price may be high. There are many vitamin C serums available in the market. But what makes Aroma Essentials Vitamin C serum unique is that it contains other good ingredients like 24k gold, rice, berberries and hyaluronic acid along with it. So if you are looking for a good vitamin C serum, I would recommend you to try this Indian brand. I would suggest you to use it along with the day serum for best results. I love trying out vitamin C serums as they’re good for lightening pigmentation. Gold leaves is a nice ingredient. 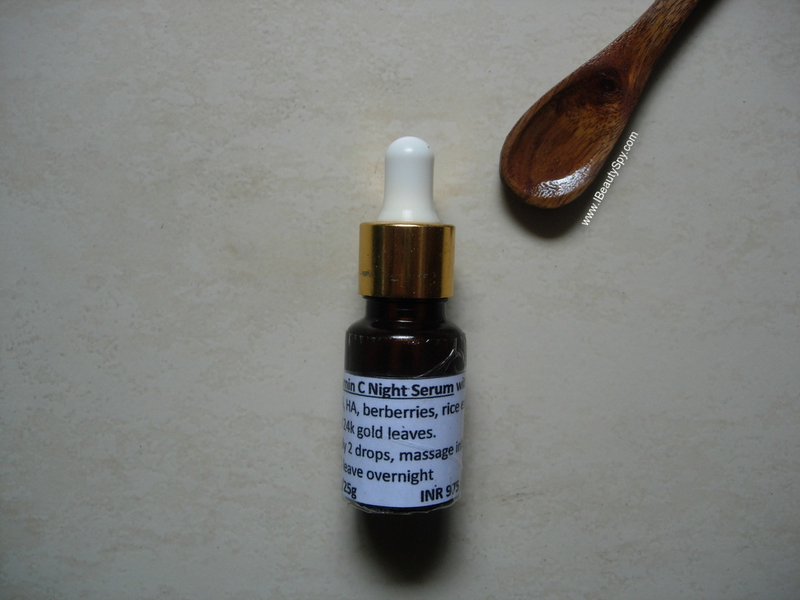 Gold leaf in a serum is something new and different , good that it does what it claims .